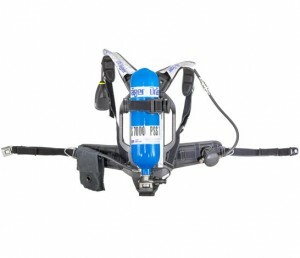 Our current airpacks or “Self Contained Breathing Apparatus” (SCBA) are almost 20 years old. 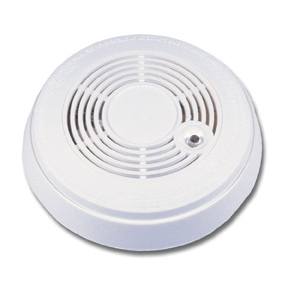 They get used at almost every practice and at every fire scene and are showing their age. The maintenance required to keep them in service is becoming so expensive and time consuming that we’re looking at replacing them. We brought in 4 different setups from the big 3 manufacturers: Scott, MSA, and Draeger. Using a 10 page evaluation form, 3 of our firefighters ran the air packs through their paces. 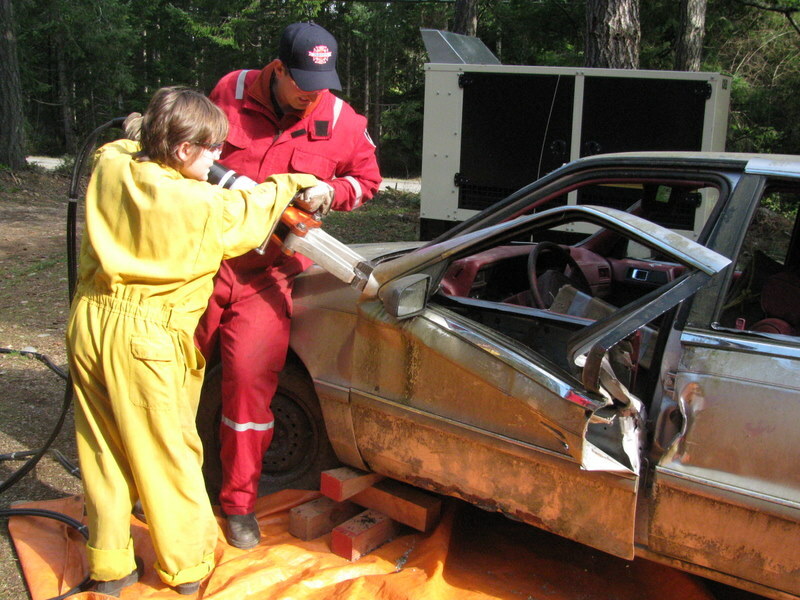 Every aspect of the packs were evaluated: Comfort, weight, ease of donning, changing the air tank, and durability of materials are only a few of the capabilities that we looked at. The results have tabulated and we are now in talks with the CVRD to move forward to the next step. At our chimney fire call today, it was pretty obvious that the weather was not going to cooperate with us. The roads were slick and the snow was still falling. When we got back to the Fire Hall we decided to chain up the trucks. This is not a decision that we take lightly. It involves an extra hour of being on a cold, wet truck bay floor after the equipment has been cleaned and put back in service. The chains are also hard on the floors, hard on the roads, and hard on the trucks themselves. Then, after the roads improve, someone has to return to the firehall and take them all apart again. All that work is worth it when we have to drive out on a cold, snowy slippery night. In fact, it was only 30 minutes after we finished chaining up the trucks that we got our second call of the day. At that point all of the drivers felt pretty good about the time spent on the cold, wet truck bay floor. New water tank at Porpoise and Depape in Sandpiper. In the event of a fire, HIFR cannot rely on having an endless supply of water from a hydrant the way urban centers do. Our hydrants come in the form of the ocean, backyard ponds, or one of the many storage tanks that we have placed around the island. When the situation calls for it, our pumper truck can empty its entire load through hoselines in under 5 minutes. We need to be able to get water on scene as quickly as possible. To this end, we have contracted Jed Young to install 4 new tanks at pre-determined locations around the island. Jed has sandblasted and painted the tanks with a rust resistant paint. The tanks are now all in their proper locations. They need to be backfilled to hold them in place, plumbed with fire department hookups, and then filled with water. We are still on schedule for having all of the new tanks usable by the end of the year. Look forward to additional landscaping during the upcoming spring season. 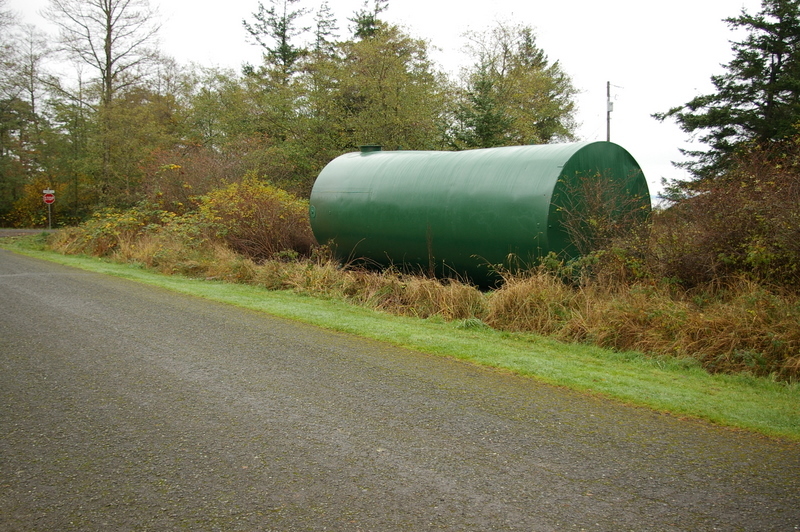 We are thrilled to have the Hornby Island Arts Council take a keen interest in integrating the storage tanks into the island landscape. 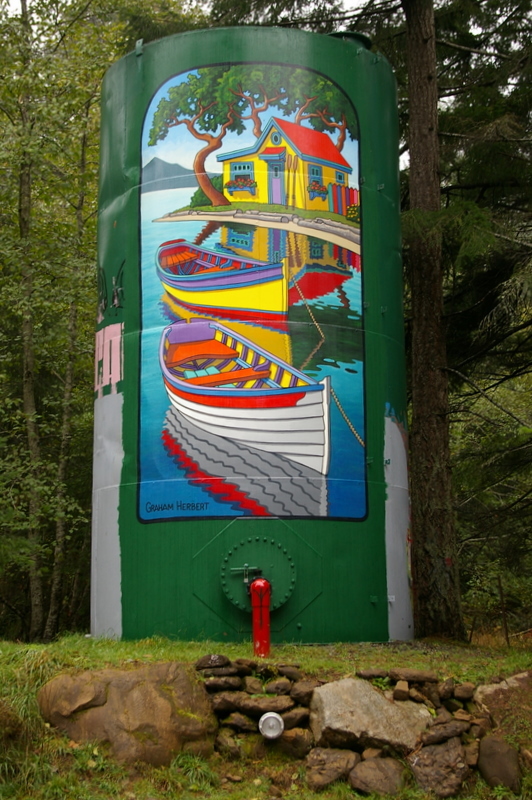 They have coordinated island artists to paint murals on each of the tanks as funding comes available. Graham Herbert has completed the latest project with his beautiful mural on the Sandpiper tank on Central road. The Whaling Station tanks on St Johns Pt Road is the next one to be done. Glen Rubina has been commisioned for that job. Elaine Savoie is also lined up for a mural on the Savoie Road tank. Ten members of the fire department gave up a Saturday to retrofit some additional floor supports in the new clinic. 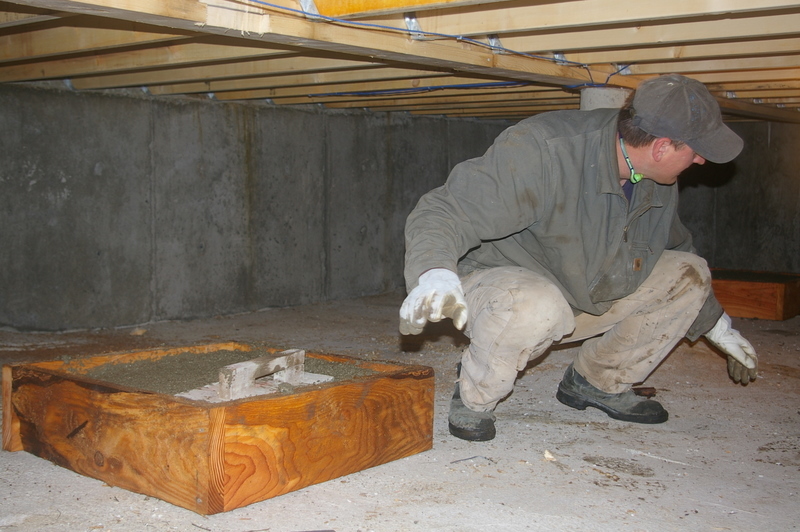 We installed 14 new footings in the crawlspace of the clinic. These footings will bear the weight of 6×6 posts that will support the existing beams midspan. 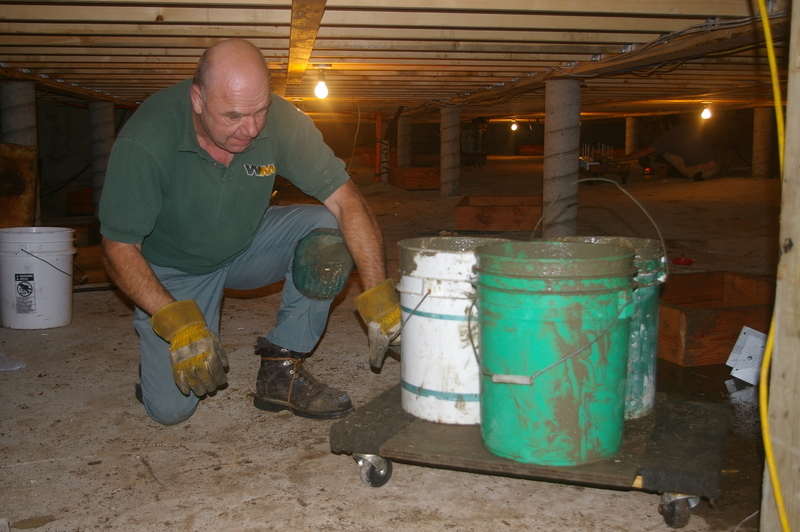 All of the concrete was mixed outside of the crawlspace, loaded into 5 gallon buckets, and pushed on dollies to the forms that were being filled. 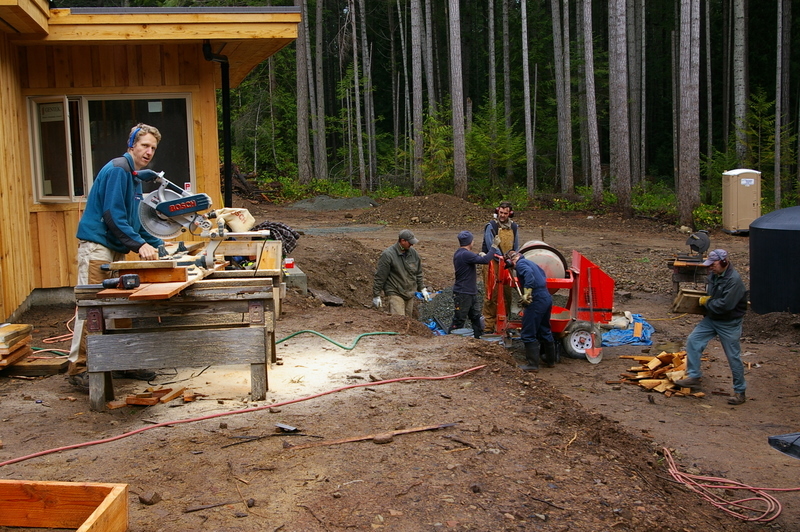 Saddles were then placed on the footings to hold the posts. 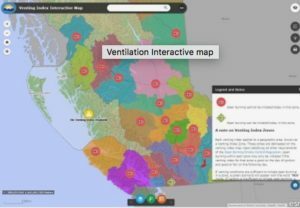 Hornby Island Fire Rescue is proud to be a part of this massive community effort to build our new medical clinic. We have a special stake in this building since it is where most of our medical calls either end or start out. We all feel a little more connected to the building having worked on it. We’ve replaced one of our ancient 18HP Hale portable pumps with a shiny new 27HP Kohler. Although it has twice the pumping capacity, it only weighs a bit more than the old one, and it so much easier to get running. Here on Hornby we have no hydrants and water supply is a big challenge for us. What we do have around here is plenty of ocean water and a few ponds and lakes. Having a high volume portable pump improves our water supply situation immensely. We’ve been spending a fair amount of time lately, on our Thursday night practices, working with the new pump to ensure that everyone gets a a chance to become more acquainted with the new beast. We’re excited to have Patrick Lui join the department this fall. Patrick is just the latest of our recruits to embark on a lifetime of training to improve his skills as a firefighter. Patrick will devote 2 evenings a week for the next 6 months to get the basic training required to become a firefighter. He has already show his worth by finishing high in the pack in our yearly obstacle course and fitness test we call the “Firefighter Challenge”. Welcome aboard Patrick!